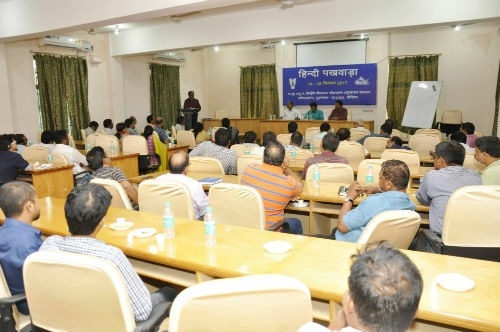 Bhubaneswar: The ICAR-CIFA organized a four day exhibition of Hindi publication in the H.L. Chaudhry Library of the Institute during 20-23 Sept 2017. The exhibition is being organized as a part of fortnight long “Hindi Pakhwada’’ celebration. The publication- books, booklets, leaflets, bulletins, training manuals brought out by the Institute during last 3 decades are on display. The exhibition aims at creating awareness of the student, scholars, researchers about ‘Rajbhasa’ and its significance. During the Pakhwada, the Institute organized a number of competitive events to encourage and motivate staff towards more use of Hindi in day today work. Essay writing, short story writing, Debate, dictation etc were organized for staff as well as for research scholars. A Workshop and an award distribution ceremony would also be held as apart of Hindi Pakhwada celebrations.